Sadly- I have not much to report. This week again has been ridiculously busy. I have started the first sleeve for my RR but...working, working, working and had 2 day training over the weekend. Loved it but many times had itchy fingers! I am looking forward to the holiday season for a few days of knitting leisure. I haven't had much time to knit this week - still not feeling the best and end of the month paperwork etc. Plus I just started A Million Little Pieces and have been in near catatonic state with book in hand until wee hours since Friday so...Also I have a real sickness when it comes to knitting. I am always more excited about a project when I begin it - so once I get to the mid-stage all I am thinking about is the next project and envisioning the yarn I will use and how to adapt the pattern and what people will say and I wind up abandoning the project of the moment. There are too many things I want to do! Tell me I am not alone!!! Please?!? 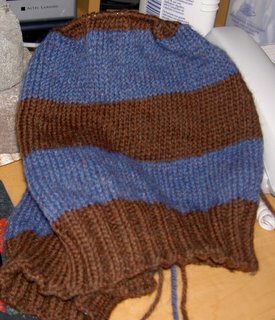 In the meanwhile here is The Ravenclaw Raglan at the end of Week 1.